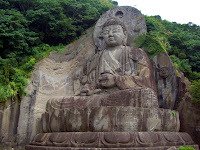 I travelled to 鋸山 (Mount Nokogiri, Japan) for the first time with めぐみ (Megumi) on 14 September 2008 to see the tallest statue of Buddha in Japan. Other memorable sights at 日本寺 (Nihon-ji temple) were the 30.3m-tall 百尺観音 (Hundred-shaku Kannon), 千五百羅漢 (1500 small statues of Arhats), and views of the surrounding lands and sea from the observatory. Before leaving, we relaxed at the closest coffee shop, just after a tunnel on the way to 浜金谷駅 (Hamakanaya station), which had a charming ambiance and a great view over the sea for sunset.